The Wizard is a popular Myrtle Beach golf course design by architect Dan Maples. Over 1 million cubic yards of the earth was used to build this course, thus creating devilish elevations! This award winning “mystical” courses is sister to the Witch and Man O’ War. The Scottish style is captured with a sorcery of holes. The rolling landscape captivates and motivates golfers to play their best. Golf Digest gives the Wizard a solid 4-star rating and recommends this course as one of the best public courses to play in America. Challenges await each player with plenty of water hazards and sand bunkers. The course’s layout consists of Bentgrass greens and crystal clear water areas. Dense woodlands and wetlands surround the area with stone bridges, which capture the essence of a “kingdom” or fortress. Skilled and beginner golfers enjoy this exciting golf adventure. 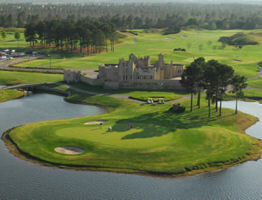 A castle style clubhouse is accessible for golfers needing a break or a moment to gaze at the course's mesmerizing scenery. Book a tee time at the Wizard for your next Myrtle Beach vacation. Golf vacation packages are available and include affordable golf tee times, Myrtle Beach golf specials, and exclusive accommodations at Myrtle Beach golf resorts, Myrtle Beach condos, Myrtle Beach oceanfront hotels, and North Myrtle Beach hotels. Book early to golf in Myrtle Beach and take advantage of incredible Myrtle Beach deals! Wide open, you can spray it around and still find your ball. Great place for golfing and fellowship is really great. Staff is awesome. Great value today. Golf only $48 including lunch and two beers. Course is average difficulty with the occasional water hole and numerous bunkers. Very good greens and fairways. Course was wet today, but the greens and fairways were in great shape! Fun and fair. Half-decently maintained. Tough finishing stretch 16-18. Poor shape, was 1 of the best. So sad. Not good. Played today 6/6 and the greens and course had been aerated and sanded. Things was when we called to make our tee time they said it would be aerated next week. When we paid it was full price and they didn’t mention the aeration. Anywhere else in Myrtle Beach they discount for aerated greens. Balls were bouncing all over the greens and comdition of each green varied. All in all a bad experience. Won’t be back! Played twice over the past week on an annual buddie trip, had a great time and really enjoyed the course. The staff was super friendly and made us feel at home. The course was in great shape, the greens were flawless, rolled true, and are super quick. You start out on a par 5 that can set the tone for the whole day and end on two extremely challenging holes. Overall I would highly recommend. This was a great course the first couple holes were really nice layout. On the second half of the course like the back nine little on the boring side nothing unique about it. And then you had the last two closing holes with a part 3 and then a par-4 were really really exceptional. The Wizard is a popular Myrtle Beach golf course design by architect Dan Maples.